Tel Aviv is actually quite a small city but it feels like a big one, with so much going on and several distinct neighborhoods. In essence, it has it all: beaches, a cutting edge art scene, amazing food, an international vibe, hot guys and 24 hour nightlife. It’s definitely one of my favorite places in the world, and one that I’ll happily return to over and over again! Start here with my basic Tel Aviv travel tips, or jump down below to read my latest Tel Aviv travel blogs. 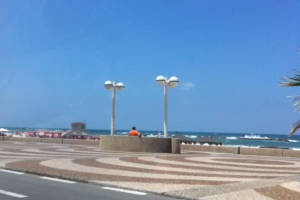 Tel Aviv is a great city to visit all year round. Being on the Mediterranean, it never truly gets cold, though the winters can be wet. Any time between June and October is the perfect time to visit for the beaches and making the most of the city’s life lived outdoors. Even though the population is less than half a million, there is always cool stuff going on, so whenever you choose to visit Tel Aviv, you won’t be bored! The Container – Often hosting free evening concerts, this hip bar, seafood restaurant and art space is without a doubt, one of the coolest places in Tel Aviv. Any time of day is a good time to visit here – there’s always something going on. Florentin Urban Culture Tour – Learn all about the street art scene in Tel Aviv with this fascinating tour run by local, Guy Sharett. He’ll teach you how to read some basic Hebrew to get the messages scrawled in the walls throughout the city, give in-depth cultural background and show you some of the coolest spots to hang out. Gelada Studio – Indulge your inner shopper by perusing the wares at this independent studio with designs from local artist Yaron Mendelovici featuring emblems from around the world. Take a look at this selection of Tel Aviv tours to help you get yourself oriented in the city and make the most of your time there. Tel Aviv is easily the most gay-friendly city in the Middle East, and its volume of gay life is comparable to London, Sydney or even Berlin! Here are some highlights you should know about gay Tel Aviv. Hilton Beach – Adjacent to the Hilton Hotel, this is known as the city’s gay beach, and for good reason – it’s always teaming with hot guys in tight speedos, making for the perfect spot to come for some eye candy. Evita – With drag nights every Tuesday, this iconic gay bar and club is one of the liveliest in Tel Aviv. Come prepared to dance all night, flirt with a local and international crowd and have a night you won’t soon forget! Pride – Taking place every year in June, Tel Aviv’s pride is a week-long festival of fun events and the biggest in the Middle East. Unsurprisingly, the parade attracts the largest crowd with up to 200,000 joining in, and it’s a street party unlike any other you’ll find elsewhere in the world – don’t miss it! Tel Aviv has a reputation for being expensive, and your biggest expense when planning a trip there is going to be accommodation. Of course, there are budget options in Tel Aviv, but it’s not hard to splash out and find something really luxurious either! I find that by using Booking.com, Agoda.com or Hotels Combined I can get the best deals, especially for last minute bookings. The essential travel apps you’ll need to make your visit to Tel Aviv easier and more enjoyable + special emphasis on gay travel apps to meet locals & more!